Edition: Malthouse Theatre, 2010. Currency Plays, 2011. There's something a little strange about Else. There's the way she bites her lip and looks at you from the corner of her eye. And the way you sometimes can't think clearly when she's close to you. And her interest in pulp romance. Oh... and the way she sometimes flies around the room. Thank God for the exorcist. 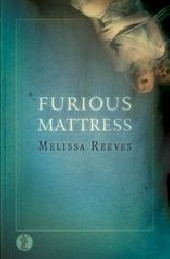 Loosely based on the Joan Vollmer case, Furious Mattress is a dark and comic exploration of faith and obsession. The play is set in a farm house in a small country town in Australia. Coordinates are given for Antwerp, the small town in Victoria which was the location of the Joan Vollmer exorcism, upon which Furious Mattress is loosely based. Heat and isolation are often referred to in the play text, and although the action takes place inside the home, the exterior world of a scorching Australian country landscape is evoked throughout the play. The 1993 death of Joan Vollmer in Antwerp, Victoria, is the real-life event which inspired the storyline of Furious Mattress. Vollmer was killed by her husband, two church members, and an exorcist in an attempt to dispel demons from her body. The small town of Antwerp become infamous as a result of this grisly event. A few hours later. Dawn is breaking. The room is full of droning flies. In the harsh light of the day, ELSE looks very dead. PIERCE and ANNA are exhausted.